Magnolia trees delight gardeners with either showy leaves, fragrant springtime or summertime flowers and seed cones that display red seeds in autumn and winter. Make sure to select a magnolia tree that survives the winter climate in your region. No one wants a partially dead tree the following spring, or one with frost-killed flower buds. 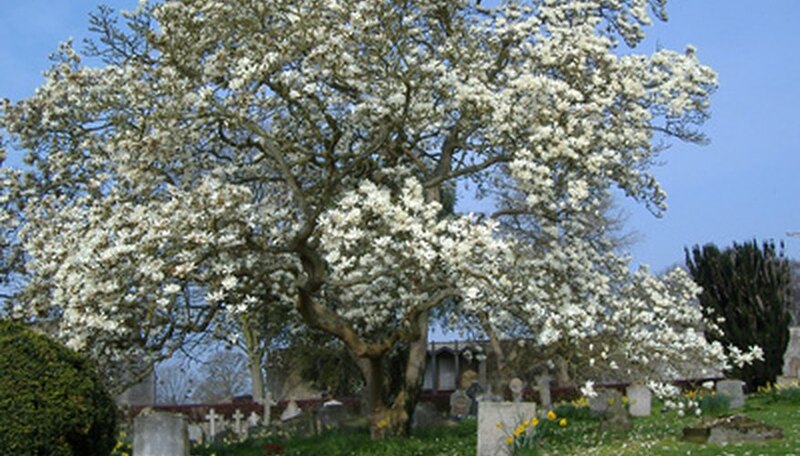 Generally speaking, magnolias grow and look best sheltered from winds. Rule out the onset of autumn as a reason your magnolia tree is yellowing and losing its leaves. There are both deciduous and evergreen types of magnolias. The leaves of deciduous varieties naturally yellow in early to mid-autumn and should not be cause for alarm. Examine the yellowing leaves, particularly the undersides. White, cottony insects or small scaly bumps indicate an insect pest that may be sucking juices from otherwise healthy leaves. Take an infested leaf to a nursery professional or cooperative extension office for exact identification and recommendations for treatment. Scrape back any mulch with a hand shovel and make a small hole in the soil under the canopy of the magnolia tree. Try to avoid damaging roots. Note if the soil looks and feels wet, moist or dry. An overly wet, soggy soil can cause leaves to drop prematurely as can dry soil conditions. Modify irrigation schedules and dosages accordingly to prevent further development of yellowing leaves. Also note if the soil seems compacted and hard. Reduce walking or driving vehicles, including lawn mowers, over the tree's root zone. Conduct a soil pH test on the soil from the hole in Step 3. If magnolia trees grow in neutral or alkaline soils (pH range of 7.0 and higher), nutrient deficiencies occur, causing sickly yellow leaves. If the soil is not acidic, consider adding an acidic top dressing like coffee grounds or an acid-producing fertilizer to the soil to improve conditions. Alternatively, a small sample of soil in a plastic cup or bag can be taken to a cooperative extension office for soil pH and nutrient analysis. Resolve to modify your maintenance of the magnolia in the future. Strive to keep the root zone around the magnolia under a 2- to 3-inch layer of organic mulch like pine bark. This retains moisture, keeps the soil cool and diminishes soil compaction. Irrigate so the soil remain evenly moist, never dry or soggy year round. Also make sure to maintain a soil pH that is between 5.0 and 7.0. If your own troubleshooting fails to supply the desired result, contact a professional horticulturist or arborist to look at your magnolia. His experience may pinpoint causes quickly and guide you to effective resources. If your magnolia leaves are infested with bugs, place it in a sealed jar or bag before taking it to a plant nursery for identification. You don't want to spread insect pests around.